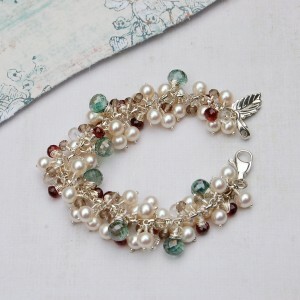 I love mixing all my pearls and gemstones altogether to see what I can come up with. Autumn will be upon us soon so I was looking to design a piece that fits the time of year so I ended up with this beautiful sparkling bracelet if I do say so myself. Each pearl & gemstone has been meticulously wired to each of the links of the chain upon handmade fine silver and sterling silver head-pins and wire. The round white freshwater pearls are 5.5-6mm to give it a fantastic stylish look. The forest green mystic quartz measure 7.5 -8mm and are interspersed along the bracelet which makes it glow and also gives a beautiful contrast to the pearls. The rubillte garnet measure 4.5 – 6.5mm and are a fantastic deep red wine colour and are also interspersed along the chain. This bracelet is very eye catching with its contrasting colours without being over powering and has a warm and glowing look about it.The bracelet is fastened with a gorgeous sterling silver lobster clasp with a lovely sterling silver leaf charm. I am working on the earrings and necklace to complete this fab autumnal set. Well it was nice to get some hot sunny weather back again yesterday as it allowed me to get a few photo’s of my earrings and necklace to complete my pearl and gemstone set which I am now pleased to have finished and put on our site for sale as this is a stunning piece of jewellery if i do say so myself and would grace any bride walking down the runway. 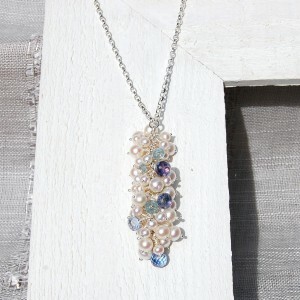 I have made the necklace in a very simple way but it looks very elegant so as not to be over powering and in your face.The dangle measures about 3 inches long and consists of white freshwater pearls which are in two sizes, 3mm – 3.5mm and 5.5mm – 6mm and are gorgeous. 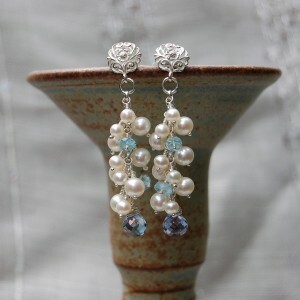 I then added Aquamarine rondelles which are 4mm in size and interspersed amongst the pearls and then we have the stunning blue mystic Iolite quartz which measure 6.5mm – 7.5mm and absolutely sparkle. I put four blue Iolite stones on the dangle as i didn’t want it to be to top heavy and become a mess so that it just has that elegant look. 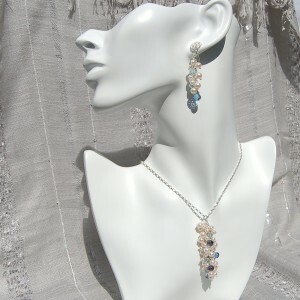 It took me a while to figure out what design i wanted for the earrings as i didn’t want to put to much on them otherwise it would look a mess and ruin the whole set so i decided to go for just one blue Iolite stone which would dangle at the bottom of the chain and be the main focal point. I used the biggest stones which were 7.5mm so they would stand out which i think looked right, your eyes are drawn to the sparkle they transmit. As for the pearls i left more of a gap between them as i felt to cluster them like the bracelet and necklace would be a mistake and they would look to bulky and lose that elegant look that i was looking for. I used beautiful ornate sterling silver stud ear pieces to hang the earrings from which i think just complete these earrings. 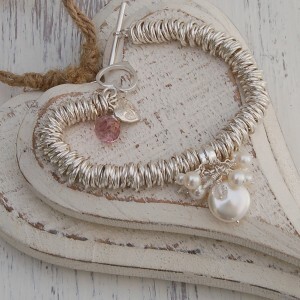 You can see when the natural sunlight hits the jewellery how beautiful it really is.